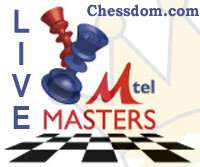 Mtel Masters 2009 will have extensive live coverage on Chessdom.com. It will start at 11:00 CET with the opening ceremony of the tournament. It will include a press conference, interviews with the participants, and drawing of pairings with the special participation of Carmen Kass. After a short break, we will continue our live coverage from Sofia with the promotional match Veselin Topalov – Vasilis Kontos (the winner in the last year’s game “Play like Topalov”) at 18:00 CET. Topalov will play blindfold against Kontos, just like against Alex Brunetti in 2007 and Jason Juett in 2008. Round 1 is on the 13th of May, all three games will be covered live on Chessdom, with GM Christian Bauer, GM Vladimir Dimitrov, and IM Miodrag Perunovic commenting. This year’s Mtel Masters is category XXI with the participation of Carlsen, Topalov, Ivanchuk, Wang Yue, Dominguez, and Shirov. This year’s Mtel Masters will be played at the garden in front of the Ivan Vazov square. A glass proof cube will be installed with a good shelter and next to it will be another construction for the journalists. The opening ceremony will take place at the ex venue of the tournament – Grand Hotel Sofia. Journalists are already gathering for the ceremony that starts is 30 minutes. The organizers have announced the program of the day. At 12:00 will be the opening ceremony, while the drawing of colors with Carmen Kass and Joaquin Espejo (the arbiter of the Mtel Masters) will take place afterwards. Five minutes are left to the start of the press conference in the Sofia hall of Grand Hotel Sofia. Inside the playing hall are many representatives of the sponsors of the event. Veselin Topalov was with them most of the time during last week participating in multiple promotional events. Because of the busy schedule he declined the invitation for Azernaijan vs. The World. First, only a few hours after his arrival from Spain he visited the Nuclear Power Plant in Kozlodui, where he was shown around the facilities. Later the same day he played against 20 representatives of the city a simul with 19 victories and one draw. 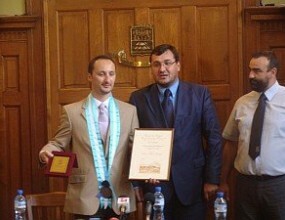 On the next day Topalov wet to Plovdiv, where he was awarded as Honorary citizen by the municipity. That same afternoon he went back to Sofia, where he received the prize Sportsman of the month (his 5th in the last years). 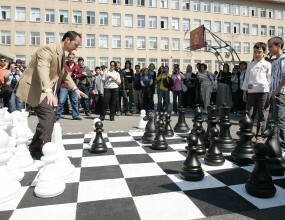 On Monday morning Topalov visited the Sofia Math School, famous for producing yearly Math Olympic champions. He played a simul there and donated a giant chess that will be installed in the school. The press conference is still going on. It was confirmed one more time that the controls will be 90 minutes for 40 moves and an hour to the end of the game. The media is showing special interest towards Magnus Carlsen. He is considered the favorite in the event, having in mind the low form of last year’s winner Vassily Ivanchuk. On May 18th the Organizers are planning the traditional Levski vs Chess Utd match. In 2007 the star of the event was Liviu Dieter Nisipeanu, while last year Ivanchuk proved to be a good goalkeeper. In this year’s edition we might see again the cousin of the forward of Manchester Utd, Dimitar Berbatoov. This is Kiprian Berbatov and he is an IM elect. All three games will be live on Chessdom.com, GM Bauer will comment Topalov Carlsen and Ivanchuk – Shirov, while Dominguez – Wang Yue will be covered by GM Dimitrov. Note: The chief arbiter updated the colors of the pairings, in the first day white will have Carlsen, Ivanchuk, and Wang Yue. Ivanchuk was obviously in a good mood and shared with BTA, “In Bulgaria I feel great, I have been many times in SOfia, in Varna. I feel positive energy here. Will this positive energy bring me another victory? I will tell you on May 23rd,” said Ivanchuk with a smile. Big photo gallery from the opening ceremony is available here. Update: the blindfold game of Veselin Topalov against Vasilis Kontos is about to start. The game has began and Topalov is opting for Modern defence. He will be playing blindfolded and with the black pieces. Kontos resisted for over 40 moves, but his time ran low and he could not do anything in the zeitnot. With this our coverage for today from Mtel Masters is over. Join us tomorrow for live comments of all games. Later tonight there will be more news from the WCCC, Bosna, Asia Continental championships, and many other events. Make sure to check out the photo gallery of the opening ceremony.